The stunning beauty of Utah & Arizona combined with the ultimate city break in Las Vegas. 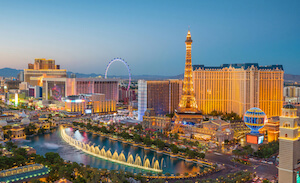 Explore some of America’s most staggering natural wonders like the Grand Canyon and Zion National Park, before swapping for high heels in party town Las Vegas! Collect your car and head out of Las Vegas towards wonderful Utah and its natural world treasures. The drive shouldn't take more than a few hours but we can always add an extra night at an airport hotel to allow you to rest if you prefer. Travel across the state to Moab today. The main highlight is Arches National Park, with its iconic red-rock landscape. The park has over 2,000 natural stone arches, in addition to hundreds of soaring pinnacles, massive fins and giant balanced rocks. This really is a wonderland of geological proportions not found anywhere else in the world. Be sure to catch the sunset in the park if you can. Enjoy another day in Moab. You may want to relax or possibly take in yet another National Park. Canyonlands is Utah's biggest in size and is a colourful landscape eroded into countless canyons, mesas and buttes by the Colorado and the Green Rivers. Heading south today you'll drive along one of the most scenic roads in Utah to the border of Arizona. En route make sure you stop at Dead Horse Shoe State Park and the town of Bluff for lunch. You'll eventually arrive at Monument Valley entering the Native American territory. Here you have one night to take in that incredible view. The world's largest and most well known geological wonder is just staggering. Two billion years in the making, the Colorado River has forged a mile deep, 18 miles wide and 277-mile long gauge into Arizona. 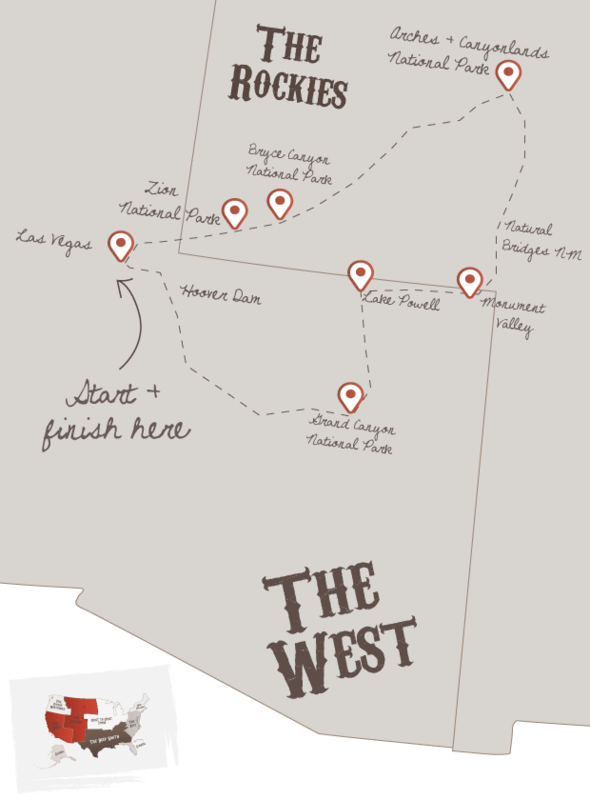 Following our routing, you'll stay at the North Rim which is quieter than the larger South Rim but has fantastic views and is less touristy too. Driving west from the Grand Canyon North Rim to the east of Page is Antelope Canyon. The canyon includes two separate, photogenic slot canyon sections, referred to individually as Upper Antelope Canyon or The Crack; and Lower Antelope Canyon or The Corkscrew. Make sure your camera has plenty of room for photos - this is the most photographed slot canyon in the southwest of America. Drive west back to Las Vegas today. Along the way, you'll skim back in and out of Arizona and Utah. We recommend a stop at Pine Spring National Monument to learn more about the historic communities of settlers that over the years have called this desolate part of the United States home. Arrive in Las Vegas for three nights to really unwind. Wake up in the luxury of Las Vegas. With so many first-class hotels, cuisine and entertainment to chose from you'll have plenty to keep you busy. Alternatively, spend the day relaxing by the pool or maybe have a flutter in the casinos. Your second full day in Vegas. If your head hurts after a heavy night maybe take a walk along the legendary 'strip'. We can help you book tickets to one of the legendary shows or shop till you drop. For great value dining, we recommend visiting one of the many buffets available in the hotels. Just make sure you are hungry when you go, you won’t need to eat again for a week! We usually try to book a late flight back to give you more time for fun and so you can sleep during the flight home. So, spend the morning at the pool or shopping before returning the car at the airport and taking your flight home. Don't forget to check out this road trip's Itinerary tab to see more amazing pictures from our 'Las Vegas & The Canyons' tour. You'll also be able to read a little bit about what you'll be getting up to on each day of this incredible road trip adventure.